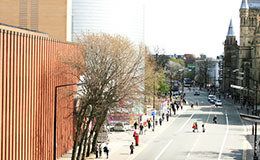 The CNC is an interdisciplinary research activity which was established in 1990 and is based in the School of Computer Science at the University of Manchester. We form part of the School's Software Systems Group. Our research is application-motivated with a mission to investigate techniques, and develop associated tools, for support of high performance computing with a focus on shared parallel resources. Our research is in the areas of parallelisation and performance tuning of performance-critical applications (performance engineering) and the flexible composition and deployment of coupled models. CNC staff teach on our School's MSc in Advanced Computer Science. CNC members have consulted for several clients, including: Fujitsu, Dell, The Met Office, Sharc and Atmos International. If you are interested in our consultancy services please contact Graham Riley.